My Favorite Season | But... Will There Be Cake? Taking a break from pregnancy posts to talk about our weekend. I don’t normally detail in minutiae our weekend adventures on this blog, but this past weekend was so wonderful that I want to remember it. As a kid, Saturday mornings were always my favorite. On a good Saturday, there would be pancakes and bacon or biscuits and gravy for breakfast, accompanied by the absolute best cartoons on TV. Now, I’m the one cooking breakfast and cleaning up, and the cartoons aren’t nearly as enjoyable (I’m starting to hate the Hot Dog Dance song from Mickey Mouse Clubhouse), but there’s just something about hanging out at home with the family on Saturday mornings that I absolutely love. On this particular Saturday, I made cinnamon and sugar toast in the oven. So easy with minimal clean up and it makes the entire house smell delicious. After breakfast, we just hung out while D played. At 11am it was kickoff time for my husband’s favorite college team – the Michigan Wolverines. I think I used some of this time to go online and order some Michigan gear for D since he’s outgrown all of his infant gear. We had every intention of leaving the house at half time to go apple picking but the game was too close and D ended up passing out about 2 minutes before halftime. I took advantage of the delay by putting away some laundry and then crawling in bed to read for a bit. Around 3pm, just as the game ended, we finally made our way to Eckert’s, about an hour away. My mom used to force take me there when I was a teenager and I absolutely hated it. I don’t know why I was such a brat about things, but as an angsty teenager, nothing sounds like more torture than hanging out with your mom and her boyfriend and going to pick apples. Then, when the hubs and I first started dating, I thought it sounded like a pretty fun date idea. And we’ve been going just about every year ever since. 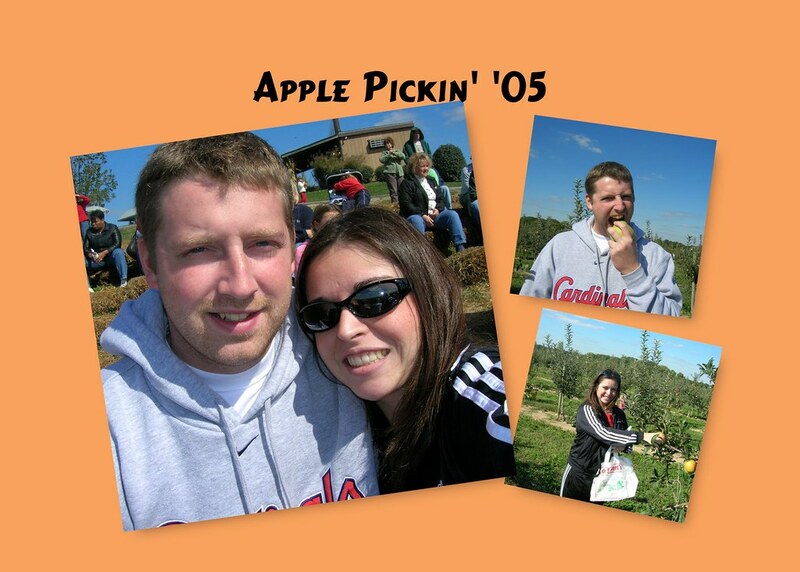 It’s one of those few seasons traditions that we’ve carried on through the years and now I’m thrilled we get to do the same with D. Here’s our first trip together, way back in 2005! The Fun Farm is fantastic for kids, though D is still a little young to fully enjoy it. He was too small to ride any of the rides or jump on the giant trampoline, but he did get to pet the goats and watch the pig races. I think he liked riding the tractor out to the orchard. And even though this kid has never been handed a full apple in his life, he knew EXACTLY what to do with it and wouldn’t let it go for about 15 minutes. Still can’t get over how cute he is here. Chuck Taylors? Baby jeans? Apple juice dribbling down his shirt? I can’t handle the cuteness. I even made sure to take my good camera but the one thing DSLRs aren’t very good at yet are taking selfies, so the only family shot we got was this one. By the time we left, little man was wore out! So back to the house we went so we could do our regular nightly routine of dinner, bath, books and bedtime. While I was on bedtime duty, the hubs busied himself by building a little bonfire so as soon as D hit the hay, mommy and daddy went outside to play. We roasted marshmallows and made s’mores and just sat outside, enjoying the cooler temps and the smell of bonfire. It only lasted an hour or so, but it was fun while it lasted. Sunday morning was just as pleasant as Saturday. A nice, leisurely breakfast of pancakes and cartoon watching, followed by our second week in a row of going to church. After we saw how much D loved the church nursery last week, we felt like we needed to go back. The first week, we went with our friends to their Sunday School class so we didn’t really get a chance to check out the service since they happen at the same time. This week though, our friends had other plans so we decided to go without them and check out the service. If we ever had any questions as to whether or not our son has separation anxiety issues, we got a very firm answer of NO this weekend. In fact, when we went to pick him up after service, D took one look at us, realized it was time to go and started bawling! Even the nursery staff were shocked since it’s normally the other way around with kids crying during drop off. But not our child. Nope. He was mad that we made him leave! After church, we grabbed lunch for my grandma and dropped by her house for a quick visit. Then it was back home so the hubs could mow the grass and I could get my pie-baking skills on. All of those apples called for an apple pie, of course! And it’s been YEARS since I’ve made an apple pie, though this time it was much easier than I remember and maybe even turned out a little bit better. So that was our weekend. Pretty simple, but full of all of my fall favorites – apple picking, bonfire and s’mores, a little church and family time, and homemade apple pie! It was just one of those perfect fall weekends that reminds me why this is my favorite time of year and to be thankful for all of life’s little blessings. I used to make special breakfasts with S every Saturday morning. I always found a new Pinterest receipt and we had fun making breakfast. That stopped with the birth of H, but I’m hoping to get back to it! Sounds like a lovely fall weekend! I always dream of a leisurely Saturday morning but with a husband who likes to go-go-go on the weekends, I hardly ever get one. This sounds awesome. I am jealous of weekend family time! Oh, and what an adorable pic of your little man. He is the cutest, those jeans and chucks… Stop it! I can’t take it! Love this post! All-American family!